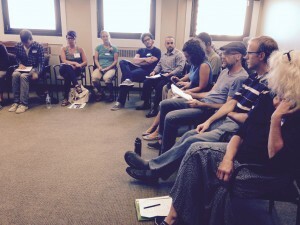 Responding to the call to a gathering on domestic fair trade in the Northeast, two dozen farmers and farmer organizers, farmworker organizers, student and union activists, and service providers for low-income workers came together for an intense 3 hours on August 14, 2015. Louis Battalen, teacher and farmer, Rose Bookbinder of the Pioneer Valley Workers Center, and Elizabeth Henderson, organic farmer and NOFA representative to the Agricultural Justice Project Board, organized the meeting and delivered introductory remarks to get the ball rolling. The core of the morning was the go-around when participants talked about why they came and the work they are doing that relates to fairer prices and wages, safer work, and ethical trading. The final hour was devoted to brainstorming next steps in cooperating, exchanging and coordinating with one another. Images of the Domestic Fair Trade Association (DFTA), its members, vision and principles, of farm worker conditions, and farmers organizing for justice flashed on the screen as participants assembled. Louis Battalen welcomed the participants, explaining that the purpose of the meeting was to provide a chance to get to know one another, share our projects and seek ways to collaborate. Introducing domestic fair trade in the northeast, I pointed out that this history has yet to be written and it is up to us to define our terms. I am an organic farmer and our farm is one of the oldest CSAs. There has been a long history of struggles to bring fair rewards to the people who produce our food – going back to the Populists. From my perspective as an organic farmer, farmers and farmworkers in the US are as much in need of fair trade as the small farmers in the global south. The reality we face is that many of the workers in the US food chain suffer from low pay, all kinds of abuses – wage theft, sexual harassment and general insecurity. Structural racism is the enforcement mechanism that keeps people of color and recent immigrants at the bottom. 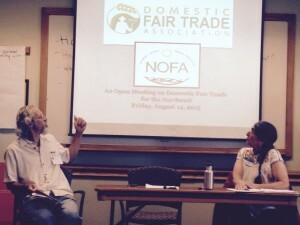 I gave a quick summary of the story of the DFTA, and explained that its main projects are to promote fair trade and to evaluate fair trade claims in the US market, and gave an introduction to the Agricultural Justice Project, which offers high bar standards for Food Justice Certification, a path to keeping fairness in organic and sustainable agriculture. Faced with the challenges of food safety and the urgent need to reduce climate change, I concluded, we must build solidarity among all food workers including farmers. Rose Bookbinder talked about founding the Pioneer Valley Workers Center a little over a year ago. She presented a project by Clare Hammonds and Niko Bazurto, of the U Mass Amherst, Labor Center, on understanding and improving wages and working conditions for farm laborers in Massachusetts. They conducted detailed interviews with 18 Latino workers and found that even in the “Happy Valley,” wages average no more than $9.60 an hour, with no raises or upward mobility, few benefits and poor safety conditions. The workers expressed a pervasive sense of discrimination. Rose concluded “We can’t have true food justice without food workers having a voice.” Her center is currently working on a restaurant workers bill of rights. community gardens, and is a founding member of AJP. The Workers Centers provide places for training and organizing workers and are engaged in research to better understand the food system and how to leverage change. From the farming sector, there was a representative of Red Tomato, which coordinates distribution of local farm products and advocates for fair trading, as well as people who provide education for farmers on best labor practices and do outreach for Food Justice Certification. Patrick from United Food and Commercial Workers (UFCW) supports organizing drives among food workers. Anthony, Jeremy and Billy work for state agencies that provide legal, training and employment services to low income workers and monitor violations. Becca and Dan research farm labor and environmental justice. Martin campaigns for GMO labeling, and connects the dots for a global perspective on food sovereignty. Three college students work on the Real Food Challenge (RFC), shifting institutional money into the local food economy, and supporting student solidarity with farm workers and fisher folks. They have persuaded U Mass to sign onto the RFC goal of 20% real food by 2020 and they are honing their definition of what “real” means. Haley wants to document the oral history of this movement. Dorian works for the Cooperative Fund of New England, providing flexible funding for coops, and volunteers as a member of the River Valley Market board. Liana organizes to maintain the integrity of the national organic standards and to raise awareness that the success of the organic market is not translating into financial success for US organic farmers. How do we best collaborate? How do we achieve unity and accountability within our movement? What are possible options for our group moving forward? All three groups expressed a commitment to continue the dialogue we began that day to identify common goals, while acknowledging differences and tensions. Communication across sectors is essential to building a movement. Suggestions include setting up a group list serv, creating a calendar of regional events, a map of groups and resources, a list of projects and help needed, and sharing specific workers/farmers stories. Group two emphasized the importance of organizing at the cultural level – not focusing on issues but the values that connect us. The upcoming conferences this fall and winter will provide occasions to continue getting together. And there were many other ideas for town meetings, flash mob events, and community garden talks. Group one focused on making sure there is worker representation when standards and policies are discussed and on the need for more research on how to judge what technologies are best for workers. In designing conferences – e.g. NESAWG – we need to make sure each topic area (food hubs, local economic development projects) also addresses issues of importance to workers and to farmer economics. Does this food hub guarantee living wage jobs? Prices to farmers that cover full costs of production? In conclusion, we agreed to collect value statements from participants and to share our priority values. All 3 Power points are available – please send request to elizabethhenderson13@gmail.com.